On a quiet side street in the hills of Kyoto, this red parasol lay against a wall, a colorful reminder of the simplciity of Japanese design. Red maples rustled overhead, their shadow making a counterpoint to the white arc of the leafs on the fabric. 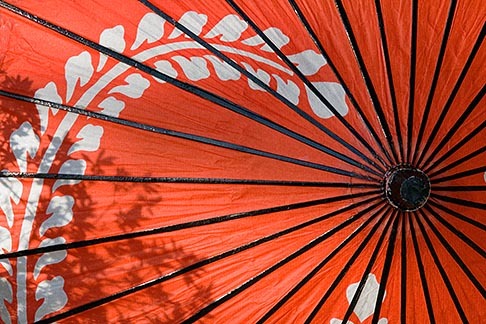 The sense of design in Japan is exquisite and it is in the small and delicate details that this is most easily seen.